When David Dow was first asked to represent death row inmates, he supported the death penalty. Capital punishment was an abstraction to him, and he imagined that death row was filled with characters like Charles Manson and Hannibal Lecter. Dow gradually realized that his perception of the death penalty and those on death row was completely incorrect. Dow began witnessing the profound injustices the inmates consistently endured: from confessions coerced by the police to bizarrely incompetent lawyers; from corrupt prosecutors and backward judges to racist juries. None of his clients was a serial killer; some had been unarmed and perhaps unwitting accomplices; most were repentant; one turned himself in; several were obviously innocent. Not one of them fit the media stereotype of the hardened, heartless murderer, incapable of rehabilitation, undeserving of even a modicum of justice. And yet these are the men Dow came to know as he fought, often unsuccessfully, for their lives. In the end, he is forced to concur with Supreme Court justice Potter Stewart’s famous pronouncement that being sentenced to death in America is like being struck by lightning; capital punishment isn’t reserved for the most heinous criminals but is meted out arbitrarily. The cases in this eye-opening book are those of the men on death row who changed Dow’s mind about capital punishment forever. You’ll meet Johnny Joe Martinez, for instance, who was executed despite the fact that Dow convinced the court that he had strong grounds for an appeal. Martinez had exhausted his right of appeal when his lawyer wrote a mere seventeen-line-long appeal; he was executed on a technicality. Roger Coleman was denied an appeal because, although his lawyers mailed the appeal notice on time, it was received literally one day too late; he was executed because his lawyers failed to use registered mail. Another inmate was executed despite his court-appointed lawyer’s shocking and demonstrable incompetence: the lawyer arrived at the courtroom drunk and snorted cocaine in the bathroom during breaks in the testimony. All of these men were executed on technicalities. These concrete accounts of the people Dow has known and represented prove that the death penalty is consistently unjust, and it’s precisely this fundamental-and lethal-injustice, Dow convincingly argues, that should compel us to abandon the system altogether. "The execution even of a guilty man is the destruction of evidence. The execution of an innocent man is by definition the exculpation of a guilty perpetrator. Those who run our death rows delude themselves that they operate a system rather than a lottery: here is living and working proof that with capital punishment, only the random is systematic. David Dow guides us through the workings of the death penalty's criminal injustice: a racket that is beyond reform and long overdue for abolition." "Mr. Dow, a death penalty attorney on the front lines in Texas, compellingly shows that sentencing innocent people to death is only one aspect of the contemporary death penalty debate. Basic fairness in the criminal justice system is of equal importance. Because such fairness is missing and cannot be restored, the death penalty deserves a grave of its own." "Americans are horrified when someone on death row is revealed to be innocent because it represents our justice system's worst nightmare-its equivalent to a major airplane crash. But Executed on a Technicality reveals an even more disturbing truth: that our nation's entire use of the death penalty is on a daily collision course with our most deeply held legal and moral principles. At once intellectually unflinching and profoundly moving, Dow's book is a must-read for anyone who truly cares about American justice." 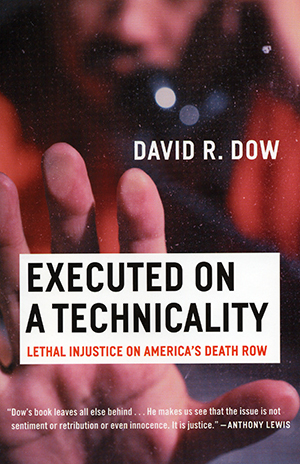 "I have read much about capital punishment, but David Dow's book leaves all else behind. It is powerful, direct, informative, and told in compelling human terms. He makes us see that the issue is not sentiment or retribution or even innocence. It is justice."